Reader Questions: How Do You Bring PowerPoint Files Down to a Smaller File Size? 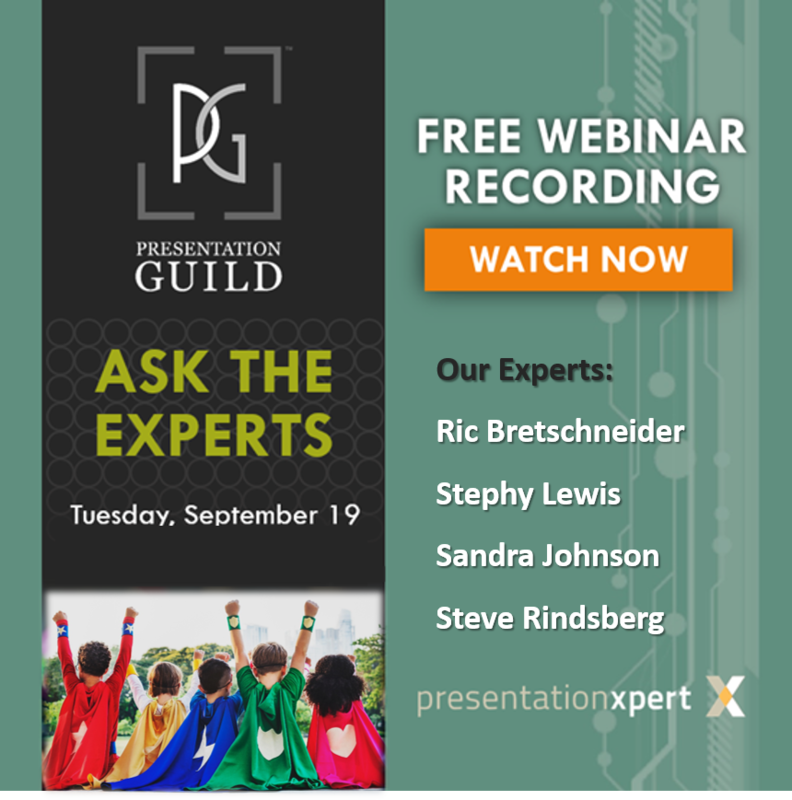 Hard drive capacities, cloud storage, and bandwidth keep increasing, but that doesn’t necessarily mean we can or should let our PowerPoint files increase in size unchecked. Text, vectors (such as .svg and emf content) and animation won’t add much to your file size—in fact, I’ve seen 100-slide decks without any images take up just a couple of megabytes—but photos and video can quickly balloon the size of your presentations if you don’t take care. 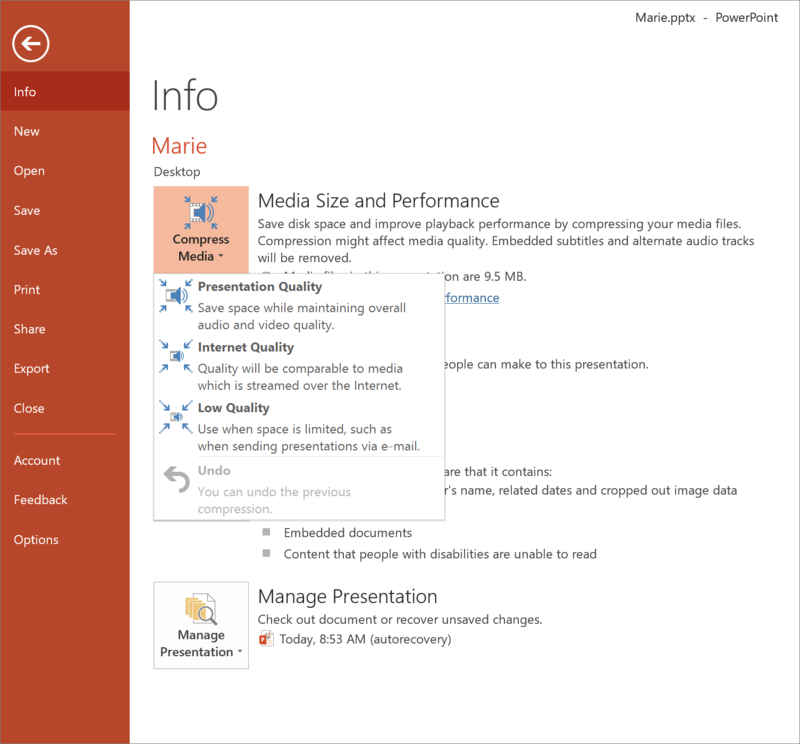 You can begin to control file size by choosing smaller images, to begin with before inserting them into PowerPoint. JPEGs will generally be smaller than PNGs (but always use PNGs for logos and detailed illustrations), and presentations designed to be printed or shown on extremely high definition screens will want higher res images. I won’t go into all the technical details of pixel size here but will say that the easiest thing to do to make sure your image has enough resolution is to place it in your presentation and project or print it and judge quality with your own eyes. Unfortunately, this will tell you if it’s big enough, but not if it is larger than it needs to be. And so, you may find yourself in a situation of wanting to reduce the size of your images after they have been placed in PowerPoint. The easiest solution is to select the image in question and then select “Compress Pictures” from the Format tab (or Picture Format tab on the Mac). 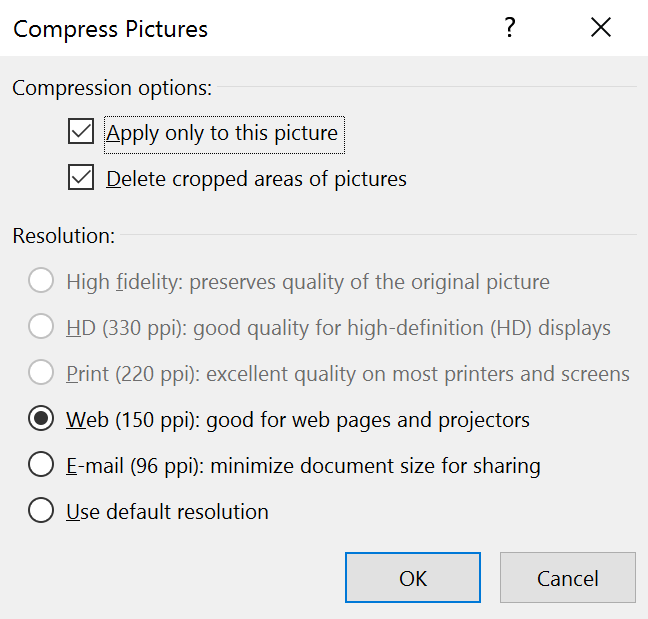 Here you’ll find options for compressing the image at different levels of quality as well as checkboxes for deleting cropped areas of pictures and compressing ALL the images in the file or just the selected one. You’re free to make use of PowerPoint’s built-in compression tools, but be warned that they’re just not very good in my opinion. In the words of my friends at SlideRabbit, PowerPoint’s compression tools are more like a hatchet rather than a scalpel. The compression results in clunky sometimes over-pixelized images. And once you compress everything, there’s no going back, so be sure you have made a backup of your file first. If Microsoft’s tools are a hatchet, then the scalpel you want comes from a company called Neuxpower in the form of NXPowerlite—hands down the best compression software for Microsoft Office that there is. NXPowerlite comes in a few different forms for Mac, PC, desktop, enterprise, etc. 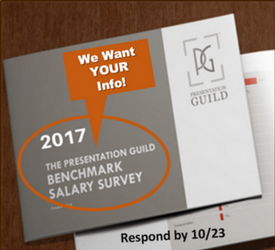 It is not expensive and entirely worth the investment if you spend your days creating presentations. How it works I have no idea, but I can say that I use it all the time and the results are magical. The interface is drag and drop, and it is all very well thought out. I’ve seen 100MB files filled with images compressed down to 5MB with no visible loss of image quality. I should note that while it is compressing images, it is also compressing the PowerPoint file itself, removing old and redundant code and other items. Do yourself a favor and pick up a copy here. While you can insert YouTube videos onto slides (PC-only) or even just hyperlinks to nonYouTube videos, in general, I recommend embedding videos as you never know when internet access will be spotty or unavailable. None of the above tools will help with compressing video, and unless you want to compress your videos outside of PowerPoint (by re-encoding them using video software), your only solution is to head to PowerPoint’s “backstage” File tab: Info and select “Compress Media.” Here you’ll be given options for levels of compression. In my experience, PowerPoint’s video compression is a bit better than the image compression, but you’ll just have to experiment and judge the results for yourself. Every once in a while, compression will still fail to reduce file size enough for your needs. 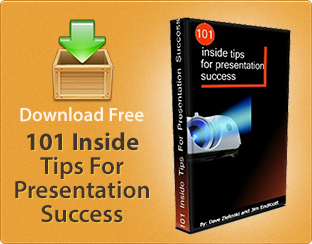 In these cases, you can actually unpack a PowerPoint file by changing the file extension to .zip, unzipping it and navigating to the media folder to search through all the image and video assets used by the file. If you discover a 20MB image somewhere, you can target just that one item. And if you find yourself expending time and energy trying to keep file sizes down, take a step back and ask if it is worth the hassle. If your file is too large to be included as an email attachment, you can always make use of services like WeTransfer, Hightail and Box to transfer large files to others. My typical workflow is to keep presentation files in Dropbox folders and then simply send a download link to clients for items that are too large for email. 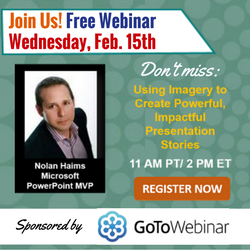 Don’t forget to register for my free webinar on Wednesday, February 15 in which we’ll discuss much more about using imagery in your presentations. Nolan runs Nolan Haims Creative, a visual communications and design consultancy that help organizations and individuals tell more effective stories with fewer words. As a Vice President and Director of Presentation for Edelman, he created and ran a department dedicated to raising the bar on visual communications and ensuring the firm showed up differently at pitches. During his tenure with Edelman, he oversaw nearly 500 high-stakes new business pitches as the firm grew by 64%. As a designer and art director, he has created high-end presentations for Fortune 500 CEOs, leading financial institutions, top foundations, and all the major television networks. Nolan trains organizations to think visually and to create and give more effective presentations. He speaks at national conferences and writes extensively on visual storytelling including at his own site, PresentYourStory.com. Microsoft has recognized him as one of only 11 PowerPoint MVPs in the U.S for his contributions to the presentation community.